I steer away from posting beer reviews here. Why? Because tastes differ. If you want to know what people who care about beer think, click over to Beeradvocate, find your beer and read on. It's free and easy. Still, every once in while I run across a beer that is so dreadfully bad and off-style that it must be reported. Such is the case with Boatswain Double IPA: Twin Screw Steamer. It's available now at Trader Joe's and you will certainly want to avoid this beer if you value your palate. Look, I don't often stalk the beer isle at TJs. No offense to them because they occasionally have decent prices on great beer. For example, they were selling blue and red label Chimay for less than I commonly see it for at Freddy Meyer the other day. That was sweet. However, TJ's sells a lot of generic beers that are not up to the standards of respected brands. You can find Ninkasi and Deschutes, sure, but it's the no-name beers that crowd the shelves. Most of these are evidently contract-brewed by Gordon Biersch. Supposition is that some of the Mission St. label beers are produced by Firestone Walker, which certainly thickens the plot somewhat. 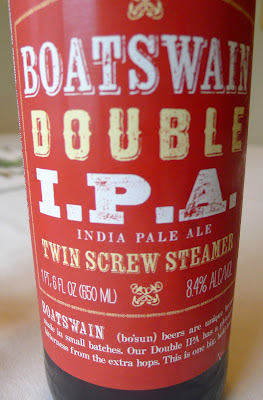 The beer in question, Boatswain Double IPA is not a generic TJ's beer. The label says it is brewed by Rhinelander Brewing in Rhinelander, Wisc. The beer isn't on Rhinelander's website. Sometimes you have to peel away a few layers of onion to get the full picture. It turns out Rhinelander was purchased by Joseph Huber Brewing Company of Monroe, Wisc., in 1967. Huber, which has roots dating back to 1845, became known as Minhas Craft Brewery in 2006. It brews all of the Rhinelander brands in Monroe, although it no longer owns the lighter Rhinelander segments. Every brewery has a story and that's certainly the case with Minhas. Check out their history here. Fascinating. 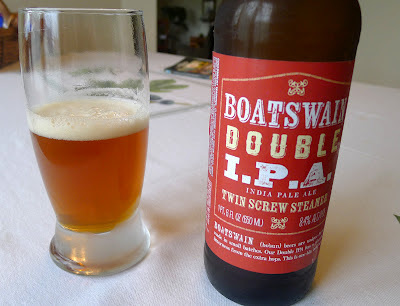 Back to Boatswain Double IPA. This beer also doesn't appear on the Minhas website. "What's up with that? ", you might say. Well, it seems likely that Minhas contract brews Boatswain under the Rhinelander name and distributes it through TJ's. Supposition, ya know. Why should you avoid this beer? Boatswain has none of the hop character you associate with a double IPA. It has almost no hop-fueled aroma or flavor. It lacks body and malt flavor. What it does possess is a subtle sweetness that is blown away by a metallic bitterness and an overwhelming (8.4% ABV) alcohol presence. If you strip away the alcohol, this beer is an empty suit. Boatswain is bargain-priced at $1.99 for a 22 bomber. I know, I know...what do you expect for $2? Well, I expect a beer that is at least on-style. And Boatswain doesn't come close. If you decide to take the plunge, keep something nearby to cleanse your palate. A glass of gasoline might work. Firestone Walker makes excellent beers. You never know what bargain or stiff you'll find at TJs. I don't like beer reviews because I think opinions can differ widely. But a beer as bad as this one deserves to be made fun of. It sounds like it's just as bad now as it was when I tasted it. I'm surprised they haven't modified the recipe, but I suppose it doesn't matter if people are still buying it because it's cheap. Speaking of cheap, I recently bought a bottle of Boatswain (standard) IPA...I just wanted see. It isn't as bad as the Double IPA, but not very good, either. I may post a review. Thanks for the input. I thought this was awful as well, in spite of cheap high-ABV thrills -- Colt 45 for hipsters. I made this mistake of throwing my money away on this Boatswain beer. What an awful purchase. Tasted like syrupy chemicals with a dollop of poop in it. Zero hop aroma, just bitterness. How could someone who's a professional brewer release this to the public? No wonder they hide the name of the actual brewery. It's an embarrassment to beer. I agree completely with your assessment, Pete. This beer is a hot mess and a real pallet, palette, and palate wrecker. Pass the gasoline, please! Thankful for the remarks on this brew co. Coming from Wisco, I can honestly say this is one brewing company and beer we all try to avoid around here, With so many other good craft brews in this state I always tell people to try something else. The worst thing about this company is that since the Minhas siblings bought the J Huber Brewing Co they've gone so downhill, they were well respected for quite a few years until they started making what they consider "Beer". Giants vs Pats: Who will buy the Beer?